The high resolution version of this photo suitable for printing is available by clicking the image. 1972 Mathematics degree from Clare College, Cambridge. 1973 Post Graduate Certificate in Education from Leeds University. 1977 Qualifying as a chartered accountant, including being placed fifth nationally in the PE1 examination out of over 4,000 candidates. 1978 Qualifying as a chartered tax advisor with an examination distinction. 1995 Passing the examinations to become an associate member of the Association of Corporate Treasurers. 1999 Becoming a fellow of the Chartered Institute of Taxation, receiving a medal for the best fellowship thesis submitted in that year. For 33 years Amin practiced as a tax advisor, finishing with 19 years as a tax partner in Price Waterhouse / PricewaterhouseCoopers LLP, retiring at the end of 2009. He was the first Muslim to be admitted to the Price Waterhouse partnership in the UK. He specialised in international tax, the taxation of derivatives and foreign exchange, and Islamic finance. Leading the firm’s team selling corporation tax software to clients for nine years. Leading the firm’s UK finance and treasury tax network for four years. Being PwC’s head of Islamic finance in the UK and a member of PwC’s four-person Global Islamic Finance Leadership Team. He has presented on Islamic finance around the world as well as advising the UK Government. From 2003 until he retired, Amin was an elected member of PwC’s 15-person Supervisory Board, responsible for overseeing the firm’s management and approving its accounts and all partnership admissions and withdrawals. Chairman of the Conservative Muslim Forum. Chairman of the Council of the Islam & Liberty Network. Chairman of the Advisory Board of Children of Peace. Chairman of Curriculum for Cohesion. His service to the community was recognised by his selection as the Clare College Alumnus of the Year 2014. In the Queen's Birthday Honours List 2016, Amin was awarded an MBE for services to Community Cohesion and Inter-faith Relations in Greater Manchester. My parents were both born in villages in Jalandhar, India, during the British Empire, in very poor families. Neither of them was able to go to school, which was one of the greatest regrets of my father’s life. My grandfather was killed accidentally when quite young, and as the eldest son my father Shadi Mehrban (his obituary is here) came to the UK for the first time in 1931. His first daughter was born after he left India, grew to the age of about 13 and died of an illness without my father ever seeing her. He worked as a door to door peddler and as a professional wrestler, and was here during World War 2. He was one of the people who founded the Manchester Central Mosque in Victoria Park, Manchester. After Partition (the division of British India into the independent states of India and Pakistan), my father spent six months searching in refugee camps in Pakistan before he found my mother’s family. Another daughter was born, and then my father returned to the UK. A few months later, he received a letter that at long last he had a son, Mohammed Amin. He celebrated this news in the traditional way, by preparing a meal for friends, at the Victoria Park mosque in Manchester. The 20 or so guests included many students and academics from the university. After the meal, they wanted to have a collection of money for the baby. My father refused and asked them instead to raise their hands for a dua (a supplication to God) that his son should become as educated as they were. My life has shown that Allah granted their wish. While I was very small, my sister who was a year or so older than me caught an infection and died. Having lost two children while he was far from them, my father then wrote to my mother, telling her to bring me to Manchester. I arrived in Britain in July 1952, aged 1 ¾, and my earliest memory is of a tantrum at our house in Manchester, wanting to go home to my grandmother, my uncles and my pet baby goat. In those early years, my mother hated Britain for its weather and alien people, and because she missed her own mother. She stayed here for only one reason, my education, and never saw her mother again as my grandmother died about a decade later. My parents made enormous sacrifices for me, which could never be repaid, but I did the one thing that I could which was to stay with them instead of pursuing a career far away in London or overseas, and they lived with me until they died. My parents stayed together for life. So many childhoods are blighted by parental acrimony and divorce. We had a stable home to live in, moving only once between my coming to the UK and my becoming an adult. Many children grow up either homeless or moving from location to location which is very unsettling. My parents were devoted to my becoming educated, and never placed any pressure on me to find paid work. I did no paid work until a couple of weeks between school and university, and never worked at university or during university vacations. Despite being uneducated, my father was a very intelligent man. I inherited an IQ (intelligence quotient ) which was measured by British Mensa at the age of 16 (when I joined them for a year) as putting me into the top 0.4% (1 in 250) of the population. My parents never asked for anything in return. However I was conscious of my own duties as their only son, of which perhaps the most important was to live with them. Accordingly I never contemplated working overseas, or even in the UK away from Manchester. Instead I lived with them, until it was a case of them living with me, until each of them died. While this did constrain my career opportunities a bit, I was fortunate that Manchester is a large city, and in my chosen profession I was able to have all the opportunity and scope I could have wished for while living in Manchester. I only bought my London flat much later in life when my parents were deceased and my children were grown up. I am conscious how many of my values such as charitable giving are derived from my parents' example. My father's obituary mentions how he began the first fundraising for the Victoria Park Mosque. In 1987 when he read the Urdu translation of an appeal for a charity that I was helping to found in memory of Ahmed Iqbal Ullah, a boy stabbed to death in Burnage High School, Manchester, my father asked me to write out a cheque on his bank account for him to sign. It was the last cheque he ever signed, as he died shortly afterwards. My parents always believed that that education was the route for me to have a better life than them. At the age of three, my parents took me to the nursery which was part of a primary school. I didn't want to go, but was dragged there, wailing, with one parent holding each arm. As soon as we got there and my parents left me, I vomited. The rest of my education career was better than this! The following day my father had to come back into the school to talk to the nursery teachers. On my first day, the other children, all of whom were white British, would not allow me to play in the nursery sandpit. Although by then I had lived in the UK for over a year, as I had always been at home with my parents, I did not have a word of English and could not explain the problem to the nursery teacher. Once she had been informed, she took action and my father did not need to return again. I also learned English rapidly, which illustrates why nursery education is particularly important for children from ethnic minority backgrounds. Although my nursery and primary school was part of a slum area, I cannot fault the effort the teachers put in. I learned to read about the age of six, and was was absorbed in books from then on. I was a model pupil, and therefore never experienced corporal punishment for bad behaviour. However there was one incident which may horrify many readers today. In my penultimate year at primary school, I had started coasting. One day, the school headteacher, Mrs Ogden, stormed into the classroom and informed me that my class teacher Mr Billington was not happy with my arithmetic work. She gave me a sheet of arithmetic problems ("sums") to do in a short space to time, say 15 minutes, and to then take the completed work to her headteacher's office. I completed the sums, and took them to Mrs Ogden. She marked them, and informed me that all were correct. Obviously I felt pleased. She then asked me why I did not get all my sums right all of the time? I had no reply. She informed me that it was laziness, and she was going to stop me being lazy. She asked me to hold out my right hand, and I was hit twice with the leather strap that she used for corporal punishment. It was immensely painful, but of course caused no permanent damage. However it put the "fear of God" into me, and I never slacked again at primary school. Once I was a confident reader, my father took me to a public library, and for many years afterwards used to ferry me to different public libraries as I found libraries varied in their content. As one does, I still remember the very first book I borrowed from a public library. It was a book of home chemistry experiments. While I read it, I was not able to perform any of the experiments. Our home did not have any of the items the author took for granted as being found in middle class households. I was such voracious reader that my father could never have afforded the quantity of books that I read. In fact we owned very few books. However one of my most treasured possessions is a one-volume encyclopedia which I got my father to buy in a bookshop, even though the price must have been a large part of his total weekly income. I passed the 11+ examination to attend a state grammar school where in 1968 I obtained 4 A levels, all at grade A. From there, I went to Clare College, Cambridge, where I obtained a mathematics degree, class 3. (I had not worked very hard.) I then went to Leeds University, where I obtained a Graduate Certificate in Education with a distinction in the written work. In 1977, I qualified as a chartered accountant, having been placed fifth in the country (out of about 4,200 candidates) in the Part 1 examination. In 1978 I became an associate of the Institute of Taxation, with a distinction in the examination. In 1995, at the age of 44, I did the examinations to become an associate member of the Association of Corporate Treasurers. In 1999, I became a Fellow of the Chartered Institute of Taxation by submitting a fellowship thesis on “A detailed review of the new UK tax rules on corporate debt.” This thesis was awarded the Institute medal for the best fellowship thesis submitted in 1999. After university, I spent one year teaching at a comprehensive school in Oldham. While there, I discovered accountancy, and trained as an accountant with a small firm in Ashton under Lyne and Hyde. I left that firm upon qualifying as a chartered accountant and specialised in taxation, joining Arthur Andersen, then the largest accounting firm in the world, in their Manchester office. After three years, I was promoted to manager, and attended the Arthur Andersen new manager school in St Charles, Illinois, USA, which my first ever foreign trip and spent a few days visiting Washington DC as I have always admired American democracy. It was at Arthur Andersen that I first developed my interest in computer technology from a user's perspective, and had special responsibility for the use of micro-computers in the Manchester tax practice. Three years later in 1984 I left Arthur Andersen to join a small firm in Wigan. I became a partner there after 18 months, but another 18 months later realised that I preferred large firms and joined Price Waterhouse as a senior manager in 1987. As mentioned above, I first developed an interest in computing from a user's perspective at Arthur Andersen, and maintained that at my small firm in Wigan. At PW starting in 1993 I led the team responsible for marketing the firm's PowerTax corporation tax return preparation software throughout the UK and was a member of PW's international network of tax technology specialists. From around 1992 I specialised in the taxation of treasury transactions, which is the reason I joined the Association of Corporate Treasurers (ACT). In fact I was the first partner within the PW tax practice in the UK to take the ACT examinations, and afterwards encouraged many others to also become members. From 2001-2005 I led PwC’s treasury taxation network in the UK. I began writing a finance and treasury blog for PwC in 2005, which I understand was the first official blog from a PwC person anywhere in the world and the first from anyone in the Big 4 accounting firms in the UK. I developed a specialist interest in this at my small firm in Wigan and continued it at PW. This led to my becoming a member of STEP (The Society of Trust and Estate Practitioners). I remained a member for a few years until my other specialisms meant that I was not longer sufficiently active in estate planning. While stamp duty is generally regarded as an esoteric specialism, I developed an interest in the subject while at Arthur Andersen, and found stamp duty issues cropping up from time to time ever afterwards. Around 2002 I led the PwC stamp duty practice in the UK for about 18 months to cover a gap between more specialist leaders. In 2003, I was elected by PwC’s partners to be a member of the Supervisory Board. This is an elected committee of 15 partners which has the responsibility of seeing how well the firm’s management is running the firm, approving the firm’s accounts, approving the admission and retirement of partners etc. The Supervisory Board also conducts the election of the firm's Senior Partner, sets his compensation, monitors his performance on behalf of all partners and if necessary has the responsibility of dismissing him. Being elected by my partners to serve on the Supervisory Board demonstrates their trust in me to supervise the firm's management on their behalf. Starting in 2005, I became an expert in the taxation of Islamic finance and then in Islamic finance more generally, being appointed as PwC’s UK Islamic finance leader in 2007 and part of PwC’s four person global Islamic finance leadership team. On 31 December 2009 I retired from PwC. I have been an avid follower of politics for virtually all my life. The earliest political memory I have is of Conservative Party posters from what must have been the general election of 1959. In 1960 I was aware of the US presidential election and despite being only 10 years old got up early to see if my hero John F. Kennedy had succeeded in beating Richard Nixon. When I was 14, I stayed up all night to watch the results of the British general election, as well as the American presidential election, and still remember Harold Wilson's phrase "the white heat of the technological revolution." It was natural for me to support the Labour Party; my father did so, I was conscious that we were poor and working class and also because Harold Wilson was so much more charismatic than Sir Alec Douglas-Home. At Cambridge I naturally joined the Cambridge University Labour Club. However I also joined the Cambridge University Conservative Association because some of my close friends were Conservatives and because the Conservative Association had more interesting speaker meetings with better food! At Cambridge I was also a regular reader of a local political newspaper sold on the streets called "The Shilling Paper." (A shilling = 5p in decimal currency.) Under its influence my views gradually became more left wing. Around that time, I was heavily influenced by the writings of Isaac Deutscher, in particular his brilliantly written three volume biography of Leon Trotsky. I also read three of Trotsky's own works, three works by Vladimir Lenin, as well as many other left wing writings. Accordingly, while I was at Leeds University for my post-graduate Certificate in Education I was a Trotskyist. I joined my first political party of any kind during that year, the Socialist Labour League which later became the Workers Revolutionary Party. However, apart from reading, my political activities consisted only of attending meetings in the Leeds University Union! Once I started teaching, I saved money and shortly made my first equity investment, £50 into a unit trust, which is a type of open ended investment scheme. Such investing is not really consistent with Trotskyist views, and my politics morphed back to mainstream Labour Party. I remained a Labour supporter during the 1970s and was devastated when Margaret Thatcher won in 1979. My first engagement with active politics came a year or two later when I joined the Liberal Party and became a deliverer of leaflets. I stood as a "paper candidate" (one who is on the ballot paper but with no party resources devoted to campaigning) for the local council. Despite my only being a paper candidate, my wife and I delivered one leaflet to the entire ward but without any success of course! Around 1983 I realised that although I fraternised well with my local fellow Liberals, when it came to any discussions of policy I tended to disagree with them and instead to agree with the Government. In particular, I had been influenced by Milton Friedman's television series "Free to Choose" which is now freely available on the internet at the link, and then by reading the book of the same title. You can also watch the first episode of "Free to Choose" below. Accordingly one day I shocked them by resigning from the Liberal Party and joining the Conservative Party. I attended my first Conservative Party conference in Brighton in 1984. That was the conference the IRA bombed; fortunately my hotel was many miles away. I can still feel the grim, totally determined atmosphere of the conference on the Friday, as all of us were utterly resolved to carry on despite the IRA. The final phrase of Margaret Thatcher's speech still rings in my ears "Democracy will prevail." After I joined Price Waterhouse in 1987 I became too busy professionally for active politics and did not attend the party conference again until 2008. However, in the summer of 2006 a personal friend introduced me to Lord Sheikh and the Conservative Muslim Forum. Since then I have been active in the CMF and currently serve as the Chairman. It has always been my nature to get involved and help. Some of my various roles within PwC have been mentioned above. The list of organisations that I am involved with gives the current position; below is a retrospective. I joined our school chess club when I was 16, and almost immediately became the boy who helped the relevant teacher to run the club, acting as the captain of the school chess team. At Cambridge and Leeds I played the Japanese board game of go, and helped to run the go club in both universities. In Manchester, I had joined a chess club, and quickly became involved in helping to run it including becoming club president. Our club was part of the Manchester & District Chess Association , and I was elected onto the MDCA Council, serving in various capacities, including being the MDCA president for two years from 1980-1982. After the metropolitan counties were created in the early 1970's, I was one of the five people who set out the Greater Manchester County Chess Association. The MDCA was a constituent unit of the British Chess Federation so I attended BCF Management Board meetings. In 1985 I was asked to become unpaid finance director of the BCF, which I did for five years including the year that the BCF staged the world chess championship in London. I continued to serve on the Council of the MDCA as a past president, and was instrumental in steering through its merger with the GMCCA to form the Manchester Chess Federation. Later on I became the MCF's delegate to the English Chess Federation. I finally resigned from my chess roles in April 2014 to concentrate on my other activities. Professionally, after joining the Institute of Taxation I got involved with the branch, serving as treasurer, then secretary and then branch chairman. Nationally I got involved around 2000 and in 2003 was elected onto the Council of the Chartered Institute of Taxation where I served until 2015 when I stepped down due to the 12 year term limit. Similarly, in 2004 I joined the Policy & Technical Committee of the Association of Corporate Treasurers. I served on the committee until late 2012 when I stood down due to time pressures. In the 1980’s I helped to set up the Asian Circle in Manchester, and assisted the Muslim Youth Foundation. In the 1990’s I helped with the initial setting up of the Ansar Finance Group, and have been a strong supporter of the Manchester Islamic Schools Trust which runs a primary school (the one my wife taught at) and two secondary schools. In the 2000’s I supported the establishment of the British Muslim Heritage Centre which is a major project in Manchester to acquire a grade 2 listed building and convert it into a residential conference centre. From June 2008 to June 2010 I was a member of the Central Working Committee of the Muslim Council of Britain and chairman of the MCB’s Business & Economics Committee. Towards the end of 2012 I joined the Council of Salford University. I also served on the Nominations & Governance Committee and the Audit Committee. I resigned in July 2013 as my role on the UoS Council was taking me away from London too much, and I wanted to concentrate more on my political and media commitments. It was a difficult decision, but in life it is important to proritise. While it is important to balance time spent on work and family with voluntary commitments, my experience has been that such voluntary commitments provide excellent personal skills development and experience. They also serve to raise your profile. As both of my parents were Muslims, they obviously raised me as a Muslim. I remember, aged in single figures, being sent to a nearby home to learn how to read Arabic text out loud. Eid was a major festival twice a year. As mentioned in his obituary, my father was one of the founders of Manchester Central Mosque in Victoria Park, Manchester. The Mosque had a regular Sunday school, but I have to confess that I missed attending quite often. One of the great regrets in my life is that I was absent on the day that Malcolm X visited Manchester including our mosque (it would have been December 1964), so I missed my only chance to see this great man. I have always had a questioning mind, and gradually became agnostic about religion. In my mid-teens, some of my friends and I applied to join the Manchester YMCA to use their snooker and table tennis facilities. On their application forms, all of my friends stated their religion as “Muslim” and had no problems joining. I had stated my religion as “agnostic” and needed to be interviewed by the admissions officer. He explained that as an agnostic, I was a borderline admissions case, but he was going to admit me along with my friends. However, he made it clear that if I had stated my religion as “atheist”, he would have rejected me! A little while later, my views changed again, from being agnostic to being atheist. I have always believed in acting on one’s beliefs, so I joined the British Humanist Association, now called Humanists UK. This was very much a postal relationship as I do not recall ever attending any kind of event in Manchester. In that sense, it was rather like my entirely postal relationship for a year as a member of British Mensa. Being an atheist did not stop me reading many library books about other religions. I also sent off for a series of free leaflets published by the Catholic Truth Society to learn about Roman Catholicisim. I do not remember any of the detail contents except for one item. Unlike probably most people I am completely clear about the distinction between “The Immaculate Conception” and “The Virgin Birth” as a result of reading those leaflets. I have always been completely open with friends, family and colleagues. My parents were of course deeply disappointed by my abandoning Islam, but it had no impact on their love for me. My belief in God returned in an unusual way. My first radio was a cheap USSR manufactured shortwave transistor radio, purchased at the age of 17. One of the programs I found surfing the airwaves was “The World Tomorrow” presented by Garner Ted Armstrong. This charismatic speaker explained that prophecies describing the world today and predictions for the near future could be distilled from the text of the Bible. The programme offered a free magazine supplied by post called “The Plain Truth” which I sent off for. I found the message of the radio programme and magazine, particularly their predictions about the future, compelling. They were part of a religious organisation called the Radio Church of God, which then changed its name to the Worldwide Church of God. From its doctrines, one would objectively describe it as a breakaway Seventh-day Adventist group. The Church described itself as the one true church, and it offered a detailed history connecting it to the apostles, via such groups as the followers of Peter Waldo. My parents regarded my becoming a Christian as an improvement on being an atheist! I was once again acknowledging the existence of God and there is a significant overlap between Islam and Christianity. The Church was strictly Sabbatarian. At the end of my first year at Cambridge University, Clare College was incredibly kind to me with my tutor Colin Turpin accommodating me all Saturday including an overnight stay at his home so that I could be sequestered in order to take one of my examination papers a day late on Sunday, to avoid breaking the Sabbath. A few years later, I became dissatisfied with the Church because it was quite clear that the prophecies they were making were not happening. Of course, many religious organisations make prophecies which they then reinterpret in the light of new developments. For example, the Jehovah’s Witnesses originally expected the second coming of Jesus Christ in 1914. When World War I happened instead, they decided that was “sufficiently close” and continued existence instead of disbanding! Accordingly, about the age of 27 I abandoned the Worldwide Church of God and reverted to Islam. I have no regrets about my detour into Christianity as I learned a great deal about the religion. As well as a thorough reading of the Bible and literature from the Worldwide Church of God, I also read about many other Christian sects, as well as more mainstream Christian texts. Although a practising Muslim from then onwards, I did not read books about it, but instead simply observed the dietary requirements, fasting, abstinence from alcohol, Eid etc. The turning point was going on Hajj, after which I became much more involved with Islam. In 2002 with my wife I performed the Hajj pilgrimage to Mecca. When I returned, I wrote a personal memoir of Hajj for my colleagues at PricewaterhouseCoopers. Looking back after eight years, I can see how much Hajj changed my life. The most important day of Hajj is the day you stand on the plain of Arafat and request blessings from God. Standing there, I realised that after good health for myself and my family, what I wanted most was to help others, especially other Muslims, to experience the personal success that God has granted me in my life. That has become my post retirement mission for the rest of my life. After your parents, nobody influences you more, for better or worse, than your spouse. Unlike my father, Tahara’s father was very highly educated, being a non-practicing barrister with four degrees. She came to Britain at the age of 11, speaking no English, but got her "A" levels. Her parents had no hesitation in letting her go away from home to attend Keele University, where she graduated in Chemistry and Biology with a minor in Education. When we got married, she was in her second year of teaching at a school in Folkestone, and completed the year. She then had 17 years at home bringing up four children, before returning to teaching on 24 hours notice to cover for an absent teacher at our daughters’ school. Tahara had previously helped in a voluntary capacity at the Manchester Muslim Preparatory School, then in its early days. Accordingly, she moved to working there and served for one year as a class teacher. The head teacher position then became vacant, and she obtained it, serving as the school head teacher for 10 years before retiring in 2007. In her last year, the school won the award for the best Muslim primary school in the North region at the Global Peace and Unity Event, and won it again the year after she had retired. We have four children, whose diversity is illustrated by their choices to study classics, computer software engineering, archaeology and Japanese at university. The eldest, Ibrahim is now a published author, and details of his first book "the Monster Hunter's Handbook" are on this website. I have often been asked why my close friends and work colleagues call me “Amin.” A few years ago I wrote it down because I was asked the question by email and I have shared it here. At 11 when I went to grammar school, they wanted a birth certificate. As I didn't have one, my father swore a statutory declaration regarding parenthood and date of birth. In that, he gave my name orally, which the solicitor quite reasonably transcribed as Mohammed Amin, which is what I have been legally since. However, by then I was used to being called Amin by my friends. This was amplified by the fact that ours was a traditional grammar school, where teachers, and to a large extent also other pupils, referred to pupils by their surname only. "Noonan, where is your homework?" Even my wife and my sister call me Amin. Amongst Pakistanis, while Mohammed is commonly used as a given name, it is usually combined with something else. e.g. I have a cousin called Mohammed Anwar, and he might be called "Anwar" by friends or "Mohammed Anwar" more formally, but not "Mohammed." However, my wife has pointed out that this is cultural rather than religious, and that Muslims from elsewhere do use "Mohammed" by itself. However, I answer to almost anything, even "Hey you." For example people I got to know at the Cambridge University Go Society (a Japanese board game) still refer to me as "Mo." Since October 2009, I have worn a Union Jack lapel pin on each of my jackets. I have written a page which explains the reason. My motto "Each of us changes the world every day. We can choose to make it a better place." is a reminder about personal responsibility and choice. Some people, for example Bill Gates or Nelson Mandela, change the world in ways that are completely transformative. Few of us can aspire to that. However each of us can do something to make the world better. Sometimes this takes a great act of courage, for example the Holocaust rescuers mentioned in "The other Schindlers"; however it can be as simple as deciding never to drop litter in the streets. All of us make choices, and we are accountable to ourselves, to our communities and ultimately to God for the choices that we make. In early 2005, I was flabbergasted to be telephoned out of the blue and told that I was to be included in the "Asian Power 100", a list of the 100 most influential Asians in Britain. The listing, eventually published in September 2005 was compiled by Carter Andersen. Even though at that time I was on the Supervisory Board of the largest firm of accountants in the UK, it never occurred to me that I might be included in a list alongside people like Lakshmi Mittal and Amartya Sen. In late 2006 Carter Andersen informed me that they intended to publish a similar list of the 100 most influential Muslims in the UK, the "Muslim Power 100". As well as including me in the list, they asked me to be part of the judging panel. The list was published in February 2007. On 30 April 2010 I was included in the "Muslim Power List 2010".This is a list of 99 individuals which is categorised by people's field of activity and I was included in the Politics and Government category. A few years later, perhaps around 2015, I learned that there was a list of British Pakistanis on Wikipedia with me included in the Business and Finance Section. In February 2019 I was contacted by a Wikipedia editor, Sansonic, who stated that he was one of the editors of that page and that his identity, Mr Hassan Sajjad, was publicly disclosed on his Wikepdia user page. On 7 November 2010 I visited BBC Radio Manchester to be interviewed by Mike Shaft. The main purpose of the interview was to discuss the relative closeness of Judaism, Christianity, and Islam as Mike's producer had read Triangulating the Abrahamic Faiths. However the interview developed into a more wide ranging chat about how I found growing up in Manchester in the 1950's as a young immigrant of Pakistani origin and what drove me to succeed in my career. Thanks to the BBC supplying me with the sound files, you can still listen to my interview with Mike Shaft. On 10 December 2010 the northern edition of the Jewish Chronicle carried an article by Nathan Jeffay based on a telephone interview that I gave him. The February 2011 edition of "Tax Adviser", the house magazine of the Chartered Institute of Taxation, carried an article about me constructing my website in retirement. On 27 December 2011 I was visited for lunch by a Muslim I had met only once before, about 20 years ago, when I gave him some career advice. While he is originally from Manchester, he now lives in western New York state in the USA. I was surprised when he asked if he could record a video interview with me. "Reflections" is the magazine for retired PwC partners and directors. The Winter 2012 issue carried a 750 word article about why I set up my website and how I went about it. The Clare College Alumni Council elected me to be Alumnus of the Year 2014. I received an MBE in the Queen's Birthday Honours List 10 June 2016. In November 2016 I was shortlisted in the category "Building Bridges - Individual". I am an Islamic finance specialist, with a particular interest in how Islamic finance is treated in Western tax and regulatory systems. Until I retired at the end of 2009 I led PwC’s Islamic Finance practice in the UK as well as being a member of PwC’s four-person Global Islamic Finance Leadership Team. Apart from PwC, I have had the following organisational involvements. I was an original member of the HM Treasury Islamic Finance Experts Group, established by the Economic Secretary to the Treasury in April 2007 to advise the Government on Islamic Finance strategy, and remained the only practicing accountant on that group until it was discontinued shortly before the 2010 General Election. Since about 2007 I have been a member of the Editorial Advisory Board of “New Horizon”, the magazine of the Institute of Islamic Banking and Insurance. From 2008-2011 I was member of the Editorial Advisory Board of the International Journal of Islamic and Middle Eastern Finance and Management. From 2008-2009 I served on the Islamic Finance For Business Working Group set up jointly by International Financial Services London and British Expertise. I regularly contribute articles and book chapters on Islamic finance to a range of professional and industry publications, many of which can be read on my Islamic finance page. In particular, I have written the Alternative Finance Arrangements (Islamic Finance) section of the LexisNexis Finance Act Handbook for every year since the UK started legislating in 2005, and the corresponding section in Simon’s Taxes which is the leading tax encyclopedia in the UK. Cambridge - In May 2009 I was asked to speak to the Gates Scholars Society. The Cambridge Gates Scholarships were endowed by Bill Gates, the founder of Microsoft with $210 million, the largest ever bequest to an English university. In terms of average intelligence this was probably the most challenging audience I have yet had. I was also joining an august list of lecturers, which includes Stephen Hawking. I composed a lecture addressing the question "Would Islamic finance have prevented the global financial crisis?" The venue was my own college, Clare. Melbourne - In July 2009 I traveled further to speak than I had ever gone before, at an international symposium on "Islamic Banking and Finance and the Current Global Financial Crisis" in Melbourne. The symposium, then the largest ever held on the subject in Australia, was being opened by the Hon Nick Sherry, Assistant Treasurer of Australia and co-hosted by La Trobe University, National Australia Bank (NAB) and the Muslim Community Corporation of Australia (MCCA). I was one of the two keynote speakers, the other being John Hewson, former leader of the Australian Liberal Party. Sao Paulo - In December 2008 I spoke at a seminar organised by the Brazilian Stock Exchange and the Brazilian Securities and Exchange Commission on "Financial and Capital Markets in the Islamic World: Opportunities and Challenges." Doing joint presentations is always difficult, but in this case the presentation was a triple act of me, Alvaro Taiar who was a partner from PwC Brazil and Lewis Cohen a partner in Clifford Chance New York. None of us had met before the presentation, although we did liaise in advance by email and conference call. In 2011 WikiLeaks revealed that in early 2009 the American ambassador quoted me in a cable to the State Department. I was the lead researcher and principal author of the report "Cross border taxation of Islamic finance in the MENA region Phase One" which was published on 13 February 2013 by the Qatar Financial Centre Authority. From both my professional career and my voluntary activities, I have developed a strong interest in how successful organisations should be run, and the boundary between management and governance. In particular my profession gave me extensive experience of client boards, both well run ones and those not so well run. I have listed some of my specific roles below. The partners of PricewaterhouseCoopers LLP elect a Senior Partner who is empowered to manage the firm, appointing his Executive Board to assist him. While the Senior Partner is accountable to the partners, they do not have the time or sufficient access to confidential information to supervise the activities of management. Accordingly the partners elect 15 partners to the Supervisory Board, which is given a number of powers under the PwC Members Agreement, including the power to dismiss the Senior Partner. PwC's website explains the role of the Executive Board and the Supervisory Board. I was elected to the PwC Supervisory Board in 2003, re-elected in 2007 and served on it until retirement at the end of 2009. During that time I was also a member of PwC's Audit and Risk Committee; PwC UK is a £2 billion turnover business which is required to publish audited accounts. The CIOT is the leading professional body in the UK for advisers dealing with all aspects of taxation. It is a charity with over 16,000 members, and a turnover of over £5 million. Its affairs are governed by its Council, and I served as an elected member of Council from 2003 until 2015 when I retired due to the application of the CIOT's term limit. In common with most other universities, Salford University is ultimately governed by its Council, which has a majority of independent members, one of whom was me. The published accounts show the significant scale of the University's operations, with revenues of £184 million in the year to 31 July 2012. I joined the Council in November 2012 standing down early in July 2014 as attending Salford University meetings was taking me away from London for a greater amount of time than I could accept. For 5 years from 1991 - 1996 I served as a non-executive director of Manchester TEC Ltd, the Training and Enterprise Council for Manchester, Salford, Tameside and Trafford. In this role, I also served on the TEC’s audit committee and took a particular interest in the operational independence of the internal audit team. We also dismissed the TEC's Chief Executive during the time I was on the Board. I was involved in the organisation of chess in Manchester and subsequently nationally from around 1970 until 2014. This has included serving for two years as President of the Manchester and District Chess Association, serving in the 1980's on the Management Board of the British Chess Federation including serving as Finance Director 1984-1989. With some organisations I am deeply involved and spend a great deal of time. Examples are being Chairman of The Conservative Muslim Forum and being Co-Chair of The Muslim Jewish Forum of Greater Manchester. At the opposite extreme, in many cases all I can do is make an annual donation to them. Rather than trying to rank them by the level of my involvement, which can change over time, they are simply listed alphabetically. William Henry Quilliam, a Liverpool solicitor embraced Islam in 1887 and took on the name Abdullah. He built a flourishing community in Liverpool of converts to Islam and established the Mosque and Liverpool Muslim Institute at 8-10 Brougham Terrace, Liverpool which was Britain's first community mosque. The building later became a registry office, but is now being restored by the Abdullah Quilliam Society as a mosque and heritage centre. 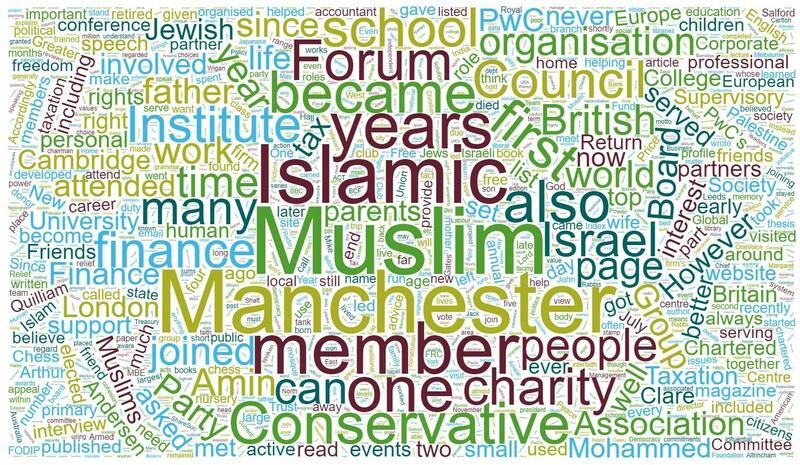 The Muslim Jewish Forum of Greater Manchester visited it in March 2015. I have joined the Friends of Abdullah Quilliam. Ever since it was set up, I have read newspaper articles by people like Madsen Pirie and concurred with the views expressed. The Adam Smith Institute is unafraid of thinking radical thoughts; for example their briefing paper "Does inequality matter?" A few years ago, I realised I should not be sitting on the sidelines but helping them, if only financially, so I joined. Since I started spending most of my time in London, I have enjoyed attending the ASI's events. This is a genocide prevention organisation that emerged from the work of the Holocaust Centre in Nottingham. It also acts as the secretariat of the All-Party Parliamentary Group for Genocide Prevention and is responsible for the Kigali Memorial Centre in Rwanda. This charity operates a mosque and Islamic centre in Altrincham, near Manchester. I started supporting them because my wife and I knew many of the people involved both socially and through other charities that we were involved in. While on average Muslims in the UK are relatively poorer and less well educated than the majority Anglo-Saxon population, because Altrincham is an affluent area, this group of Muslims consists mostly of highly educated individuals with many doctors and other professionals. Because we are a free society, our citizens need not fear arbitrary arrest and imprisonment or torture. Many in the world are far less fortunate, and Amnesty does wonderful work in this area. I have given occasional pro bono advice since the organisation was established in the early 1990's. It is a community Islamic finance initiative. I am very supportive of Muslims serving in the UK's Armed Forces. Accordingly I was delighted to be asked to join the Armed Forces Muslim Forum, and I attended the launch event at the Ministry of Defence on 23 July 2014. The Conservative Muslim Forum website also has links to the Armed Forces' recruitment pages. Associate Membership of the ACT is one of my professional qualifications. I also served as a member of the Policy & Technical Committee from 2004 - 2012. I am deeply concerned by the persecution of Christians around the world, including in many Muslim majority countries. Barnabas Fund is a UK charity which combats such overseas persecution and I give it an annual donation. Bright Blue is an independent think tank and pressure group for liberal conservatism. It is dedicated to championing liberal, open, democratic and meritocratic institutions, values and policies. BRAIS is a learned society and professional organisation focused on enhancing research and teaching about Islam and Muslim cultures and societies in UK higher education. The association provides a forum for academic exchange for scholars with an interest in any aspect of Islam and the Muslim world (including non-Muslim majority societies), and acts as an umbrella organisation for members working in a wide range of disciplines and geographical interest areas. I first became aware of BRAIS after receiving a mailshot about the three-day BRAIS Conference 2015 which I attended. As I have a strong lay interest in Islamic studies, I have joined as an Associate Member. Merchavim (the Institute for the Advancement of Shared Citizenship in Israel) is an NGO in Israel founded by Mike Prashker. I met him in 2009 when I visited Israel with FODIP, and in 2013 became a donor. This charity has bought a splendid listed building near my home which will be a residential conference centre and will include a permanent exhibition about Islam in the UK. I provide them with informal pro-bono advice. This is a national campaign and membership organisation seeking to legalise assisted dying, within upfront safeguards, for terminally ill, mentally competent adults. I joined because I believe that terminally ill patients should have the right to decide for themselves whether to continue to live in pain or to end their lives. I knew that after I left PwC I would need a place to meet people occasionally, and somewhere to spend the "gap time" that often arises when you have a series of events in central London that are not exactly consecutive. The Carlton Club was the obvious choice, since you cannot become a member without being a supporter of the Conservative Party. The Carlton Club Political Committee organises regular lunches and dinners with leading Conservative politicians which are also a good place to meet other members. I passed the examination to join the Institute of Taxation (now the Chartered Institute of Taxation) in 1978. It is the professional body I have been most actively involved in, as giving tax advice was my career from 1977 until I retired at the end of 2009. From 2003 until 2015 I served on the Council and on the Corporate Taxes Subcommittee. I retain an active interest in tax policy. This is a non-partisan, multi faith charity dedicated to building friendship, trust and reconciliation between Israeli and Palestinian children, aged 4 - 17, and their communities. I recently became a Friend of the charity because I believe that action on the ground can help to bring about reconciliation between Jews and Palestinians, and because children’s lives should not be blighted while adults spend years negotiating peace. I have also given them an interview. Through a mutual friend, I met Dr Eddie Powell who has organised an appeal to endow a studentship for a Palestinian post-graduate at Churchill College. Even if a two state solution were to be achieved tomorrow, the Palestinian people would still need our help which is why I have supported the scholarship appeal. I attended Clare College many years ago. It is the most popular college in Cambridge, receiving the highest number of applications per place, and indeed Clare has the second highest absolute number of applicants after Trinity College. Since 2011 I have served on the Alumni Council as Year Group Representative for my matriculation year of 1969. I was delighted to learn in September 2013 that I had been chosen as Alumnus of the Year for 2014. An impromptu speech at a celebratory dinner hosted by Lord Sheikh enabled me to share some very personal thoughts about how attending Cambridge changed my life. I also gave a passionate speech at Clare College when I was presented with the award, and on the same day was interviewed by a student. The interview was published in the Clare News Summer 2014 edition. The Concordia Forum is a Muslim retreat organised by Unitas Communications. I attended every annual session from 2008 (inception) to 2012, missed the 2013 gathering, attended in 2014 but have since missed it. The Conservative Europe Group (CEG) is the officially recognised organisation within the Conservative Party committed to a positive and constructive approach to our role in the European Union. I have supported it for many years and location in London now allows me to attend its events. I visited Israel for the first time over the 2009/2010 new year with FODIP. Even before the trip, I regarded myself as a friend of Israel, on the grounds that if you believe in a two state solution, then being a friend of Israel is not inconsistent with being a friend of Palestine. At the 2010 Conservative Party conference the Conservative Muslim Forum stand was adjacent to the Conservative Friends of Israel stand, so I took the opportunity to join CFI. I have been a member of the Conservative Party for over 30 years and am the Chairman of the Conservative Muslim Forum. I write regularly for the Conservative Home website whose editor Paul Goodman issued a nice congratulatory message when he learned I had become the Chairman. From its establishment in 1967, Caabu has taken on a strong political, educational and media role. A cross-party organisation, with Chairs from all the main political parties, Caabu works to advance Arab-British relations through its support for international law, human rights and democracy. I support it by being a member. CCJ was founded in 1942 by Chief Rabbi Joseph H. Hertz and Archbishop William Temple. The aim was for Jews and Christians to meet together in local groups, to understand each other a little better and to recognise the humanity in the other. I became a member in late 2014 after learning that you do not need to be Christian or Jewish; the sole requirement is supporting its objectives. Curriculum for Cohesion is developing a method for understanding religion in a multi-faith world, with a focus on Islam, for the use of teachers, lecturers and the judiciary. I have been passionate about freedom of speech from childhood. From memory, the first law book I ever read, as a teenager, was an American one called "Censorship, the Search for the Obscene." The Defend Free Speech campaign brings together people from all walks of life. Secular and religious, right and left. We have recognised the threat to free speech from Extremism Disruption Orders. We want the Government to pull back from the brink before the legislation passes and guarantee freedom of expression and the right to debate. This charity advances social cohesion by connecting communities through dialogue. It was founded by British Muslims of Turkish background inspired by the teachings and example of Fethullah Gulen. I first met them in 2009 when I spoke there on behalf of the Conservative Muslim Forum, and have since attended a number of events, including visiting Istanbul as their guest to meet organisations they co-operate with. They have recently launched their community dialogue manuals. Ekklesia is a Christian think-tank which orients its work around the changing role of beliefs, values and faith/non-faith in public life. I support it because the issues it works on matter to Britons of all faiths and none. I believe it is important to have an electoral system in which every vote counts, and in which you can vote for the candidates you really support, rather than having to second guess how you think other people will vote. The single transferable vote system would be far better than our current "first past the post" system. I also think it is much better than "party list" systems, as it gives more power to voters rather than to party machines. English PEN is the founding centre of a worldwide writers’ association with 145 centres in more than 100 countries. It is also a founding member of the Free Word Centre. Amongst other goals, it campaigns to defend writers and readers in the UK and around the world whose human right to freedom of expression is at risk. I became a member in May 2015. Since the age of 12 I have believed passionately in the importance of the European Union for bringing the peoples of Europe closer together. The vision of its founding fathers was to make another war between European countries impossible. The voice of European countries in the world is far stronger when they stand together. The EU has also made European countries much richer. The Financial Reporting Council (FRC) regulates auditors, accountants and actuaries, and sets the UK’s Corporate Governance and Stewardship Codes. In mid-2018 the FRC set up the FRC Investor Advisory Group to provide a regular forum for the FRC to engage with representatives from across the investment chain. I am a member, representing both the UK Shareholders' Association and ShareSoc. I am the only one of the members of the Investor Advisory Group who is there to represent people investing their own money, as opposed to intermediaries, asset managers and other professionals. This body used to be called The Three Faiths Forum, and in that format I was a member of the Consultative Council given my view of the importance of interfaith dialogue. I continue to support it in its new incarnation. FODIP works to promote dialogue between Christians, Jews and Muslims in the UK regarding Israel and Palestine. This issue often impedes inter-faith understanding, and FODIP assists non-confrontational discussion. I first met the Co-Founder and Director of Forward Thinking, Oliver McTernan, in 2010 and have since seen him from time to time. Forward Thinking is a charity which promotes a more inclusive peace process in the Middle East, other dialogues in Arab countries, and in UK promotes greater understanding between grassroots Muslim communities and wider society. Four decades ago, I spent many happy, and solitary, hours lost amongst the shelves reading obscure books that had no relevance to my degree. Accordingly, a few years ago I became a life member of the Friends. We have a very rich cultural legacy in the UK, and all of us should value it. The Royal Academy is a key national institution, and being a friend is a way of supporting it. Global Strategy Forum promotes fresh thinking and active debate on foreign affairs, defence and international security issues. They hold very interesting lunchtime events in central London. As well as the speakers being experts, the audience normally contains many diplomats, politicians, think tank members and journalists. I have been attending events for many years and recently became a "Full Supporter." My piece Reflections on Visiting Auschwitz explains what the Holocaust means to me. This museum in Nottingham provides a range of facilities for people of all backgrounds to explore the history and implications of the Holocaust and emphasises how current and future generations must carefully examine and learn from it. A few years ago I dedicated a rose bush in the garden of remembrance for one of my Jewish friends, the late Henry Guterman MBE, who was founding co-chairman of the Muslim Jewish Forum of Greater Manchester. Hope not hate is a campaigning organisation which grew out of Searchlight Magazine and which now publishes its own magazine. They work to research, document and counter far right extremism. The charity, the Searchlight Educational Trust recently published the report Fear & Hope: The New Politics of Identity based upon detailed polling regarding attitudes to social change, immigration etc. This UK registered charity provides inclusive prayer arrangements that do not discriminate between men and women, or between sects. My wife and I attended our first Inclusive Mosque event in September 2017 when we prayed there on Eid al-Adha. I now give them a small annual donation. Index on Censorship campaigns for and defends free expression worldwide. I have regard freedom of speech as a vital human right from my earliest years. I met the editor of Index on Censorship magazine during a fringe meeting at the 2016 Conservative Party Conference and have now become an annual donor at the "Index Champion" level which includes receiving the quarterly magazine. I trained as a chartered accountant from 1974 - 1977. From the time that I qualified, when asked my profession, if I want to give a concise answer, I have always stated "Chartered Accountant". Despite it being my main professional qualification, I have been relatively inactive as an ICAEW member; instead most of my activity has been with the Chartered Institute of Taxation as that was more relevant to my specialist interest in taxation. While I was at Arthur Andersen, one of the people I reported to was instrumental in setting up the North West branch of the IFS, so I became a regular attender as well as doing much of the "legwork" in running the branch for a few years. I became a personal member in 1984 when I left Arthur Andersen, and have been a member continuously since then. I attend some of their events, but have no other role. I gave an Islamic finance lecture for them in their series of evening lecture every year from 2006 until 2015. I have also spoken for them at other events, as well as providing informal advice and serving on the editorial advisory board of their magazine New Horizon. Interfaith Matters is a small charity which promotes inter-religious dialogue and brings faith leaders together in order to organise local charitable or social action projects. The charity runs four interfaith forums and works with over 60 leaders that serve in five London Boroughs. I have known the director, Steven Derby, since 2012 and became a small regular donor in 2017 in response to an appeal. This relief charity operates mainly in the occupied Palestinian territories. The Wikipedia article on Interpal recounts the many times that it has wrongly been accused of funding terrorism. Despite my comments with regard to Islamic Relief and donating to only one large relief charity, I respond to the annual appeal I receive from Interpal primarily out of sympathy regarding this persecution. My donating to Interpal was used by Hasan Afzal to criticise me. Apart from a correction of detail, I considered this aspect of his criticisms as not requiring any response. This was founded in Istanbul in 2011 and was originally called the Istanbul Network for Liberty. It is a group of think tank leaders, primarily from Muslim majority countries, who are dedicated to advancing universal human values such as liberty, peace, tolerance, respect, integrity, and equality under the law among the world’s Muslim communities. The Islam and Liberty Network seeks to achieve free and responsible societies in Muslim majority countries, and sees its mission as eExploring and promoting a Muslim case for freedom. The Islam and Liberty Network is registered as a non-profit foundation under the name “Istanbul Network for Liberty (L) Foundation” in Kuala Lumpur, Malaysia. It is governed by a Council / Board of Directors. I joined the Council towards the end of 2017, and became its Chairman in early 2018. Islamic Relief is an international aid and development charity founded in the UK in 1984 by Dr Hany El Banna. There are very many Muslim relief charities; I believe it would be more efficient to have just one or two large ones, which is why most of my disaster relief and similar donations go to Islamic Relief. We are fortunate to live in one of the freest societies in the world. However, preserving such freedom requires perpetual vigilance, and Liberty, previously called the National Council for Civil Liberties, plays an invaluable part in this. This school was attended by both of my sons. I have donated a perpetual bursary and addressed their senior school assembly, with a willingness to help the school where I can. Miriam was one of the 52 people killed in the "7/7" London bombings of 7th July 2005. For me, she has always been the individual reminder of all the victims whose lives were cut short, because I attended an event organised by the charity shortly after it was set up. I have supported it in a small way since then. Modern Europe is a British-based think tank which in the wake of the EU referendum decision recognises that “we cannot turn our backs on Europe – we are part of Europe.” It seeks to identify the issues facing Britain as it ends its membership of the EU and debates its future relationship with the wider world. I became an individual member in early 2017. I occasionally speak for Mosaic at schools in Manchester. I also acted as a judge for the Mosaic 2010 achievement awards. This organisation brings together British Muslim intellectuals to explore, debate and discuss the pressing intellectual problems and issues facing British Muslim communities and wider society; encourage and support the pursuit of excellence in knowledge and thought. I am a fellow. In 2005 along with several other people I helped to set up the Forum and served as the treasurer. This has also led to speaking regularly at Limmud events in Manchester, Liverpool and Leeds. In December 2010 The Jewish Chronicle wrote a profile piece about my work for the MJF. In October 2010 I gave a conference address about the work of the MJF. In 2013 I became one of the two Co-Chairs. MYH provides faith and culturally sensitive services to Muslim youth in the UK. Its core service is a free and confidential emotional support service available nationally via the telephone, email, internet and through the post. The service uses male and female volunteers trained in active listening and basic listening skills to respond to client enquiries. While I grew up in a very caring and supportive family, I am conscious that sadly many British Muslims do not, and they need such a service to turn to when facing personal difficulties. By supporting it, I am helping to preserve Britain's heritage of scenic landscapes and stately homes. This is an initiative which aims to utilise Zakat funds and voluntary donations collected in the United Kingdom for charitable work in the UK. I have long believed that too much UK Muslim charitable giving goes overseas, and was therefore pleased to see this initiative being launched. New Horizons is relatively new charity, but I have known the Chair, Dilwar Hussain, for many years. The organisation engages in critical discussions around Muslim identity, tradition and reform to provide a positive vision of what it means to be a Muslim in Britain today. They want people to understand and appreciate better the value of open, democratic and diverse societies; the value of free speech, individual liberty and human rights; and the importance of our common humanity. This organisation believes that Israel can only survive and prosper in the long term if it also protects the rights of all its citizens, tackles poverty, promotes religious tolerance and inspires peaceful co-existence. It is often attacked by the Israeli "right". I started supporting it because I share its vision and am conscious that 20% of Israeli citizens are Arabs and have now attended several of its meetings. In mid-2015 I met the chairman of this charity, and decided immediately to support it because I have always believed in the power of ideas. It work is to supply electronic copies of the seminal texts on freedom to people in Africa, Asia and the Middle East where they are not otherwise readily available. A text of mine, "The principles of job creation" is now included amongst the texts they distribute. Neve Shalom / Wahat al-Salam is a mixed Jewish, Muslim and Christian village in Israel which I have supported since a friend told me about it a few years ago. In December 2009 I was delighted to visit it on my first trip to Israel organised by the Forum for Discussion of Israel and Palestine. OneVoice is an international movement aimed at helping Israelis and Palestinians work towards a two state solution to their conflict. The organisation has an associated UK charity, OneVoice Europe, to which I donate. In February 2016 I commenced a small annual donation to this organisation. Their self description is: "Open Rights Group is the UK's only digital campaigning organisation working to protect the rights to privacy and free speech online. With almost 3,000 active supporters, we are a grassroots organisation with local groups across the UK." All my life I have regarded freedom of speech as a vital human right. This charity runs a subscription library in Manchester opened in 1806. I became aware of it because the North West branch of the International Fiscal Association used to hold its meetings there. I regard supporting such local city institutions as a duty when Manchester and Britain have given me so much. Quilliam describes itself as "the world’s first counter-extremism think tank set up to address the unique challenges of citizenship, identity, and belonging in a globalised world. Quilliam stands for religious freedom, equality, human rights and democracy." I have known the people there since 2009, but only became a small recurring donor at the start of 2017 when I joined the "Quilliam Circle". Founded in 1988, Rabbis for Human Rights is the only rabbinic voice in Israel that is explicitly dedicated to human rights. It represents over 100 Israeli rabbis and rabbinical students from different streams of Judaism, to inform the Israeli public about human rights violations, and to pressure state institutions to redress these injustices. I came across it when I visited Jerusalem at the end of 2009 and met its then inspring director, Rabbi Arik Ascherman. I have also met him on his visits to the UK. One of the other inspiring rabbis I met during that visit to Israel was Rabbi Ron Kronish, who then ran the Interreligious Coordinating Council in Israel. That body has since become a department of Rabbis for Human Rights. I am fortunate to have grown up and lived in a period where Britain has not needed to have conscription. However, even though I have never been a member of our armed services, I am extremely conscious of the debt we owe to our servicemen, and the need to support those who have suffered physical or mental injuries. I became a fellow around 2005, and read the society magazine. However I only occasionally manage to attend its events due to shortage of time. The RSA however does provide a convenient central London venue at which to meet people. ShareSoc is a society for individual shareholders. I support it because I regard it as important for individuals to assert themselves as the ultimate owners of quoted companies. I have agreed to get involved where my technical specialisms are relevant. The founder and chairman, Roger Lawson, was previously a board member of the UK Shareholders Association. This charity was set up by Robert Peston in 2011 to provide state secondary schools and colleges with talks from a range of industry leading professionals, public figures and academics, free of charge. I was introduced to it in late 2014 and since January 2015 have been giving talks for it. Although I incline towards monetarism, I joined the TRG in the 1980's, shortly after joining the Conservative Party, because I believe in "One nation Toryism." This is a UK charity that supports the work of the Abraham Initiatives in Israel. 20% of Israel's citizens are Arabs, and they face a number of disadvantages which this organisation is working to eliminate. This UK charity supports the Bereaved Families Forum, which is a group of over five hundred Israeli and Palestinian families who have lost loved ones during half a century of the Israel / Palestine conflict who are calling for an end to violence. I met some of the bereaved when they visited Manchester a few years ago, and met one of them again during my trip to Israel and the West Bank at the beginning of 2010. The Bereaved Families Forum was mentioned by Barack Obama in his 19 May 2011 speech about the Middle East. UKSA is a members’ organisation pledged to fight generally for the rights of private investors. I have been a member since the early 2000's as I consider that the rights of private investors are often overlooked by city institutions and rule makers. Since mid-2014 I have been a member of the Policy Team, which has involved helping to prepare UKSA's feedback on several Financial Reporting Council consultations. Unlock Democracy seeks "a written constitution that serves and protects the people. That constitution would define the roles of, and relationships between, the Executive, Legislature and Judiciary. It would determine how, and to what extent, power is shared between representatives at local, national and United Kingdom levels, and with international organisations. It would enshrine basic liberties and human rights for all." I read the US constitution in my twenties, and have been inspired by it ever since which is why I believe so strongly in consitutional reform. This is a non-profit, joint organization of Jewish and Palestinian citizens from Israel and Palestinians from the Occupied Palestinian territories. It believes that both Palestinians and Jews have the right to live with equal and comprehensive human rights. I donate to its associated UK charity. The Institute studies relations between Jews, Christians, and Muslims. It is named in honour of Lord Harry Woolf, former Lord Chief Justice of England and Wales and was founded by Dr Edward Kessler MBE, described by the Times Higher Education Supplement as ‘probably the most prolific figure in interfaith academia’. I got to know Ed Kessler via my involvement with the Muslim Jewish Forum of Greater Manchester and the Institute is one of the partner institutions of the Curriculum for Cohesion project. This is the second youngest livery company in the City of London. It was the natural choice given my profession, and I joined because I believe Muslim citizens need to play their full part in all aspects of our society. My wife and I visited Yad Vashem at the beginning of 2010. I have written about what the visit meant to me, and have also become a donor to the UK support charity. Out of curiosity, I used the free software at WordClouds.com to generate a word cloud of this page. It was quite interesting as a way of seeing what I mention the most. It is reproduced below.